At the 2009 ALSA Grand National Show, a Versatility Champion was awarded for each youth age division for the first time. Points were awarded according to placings for all five of the youth classes offered: Showmanship, Obstacle, Public Relations, Pack, and Youth Judging. 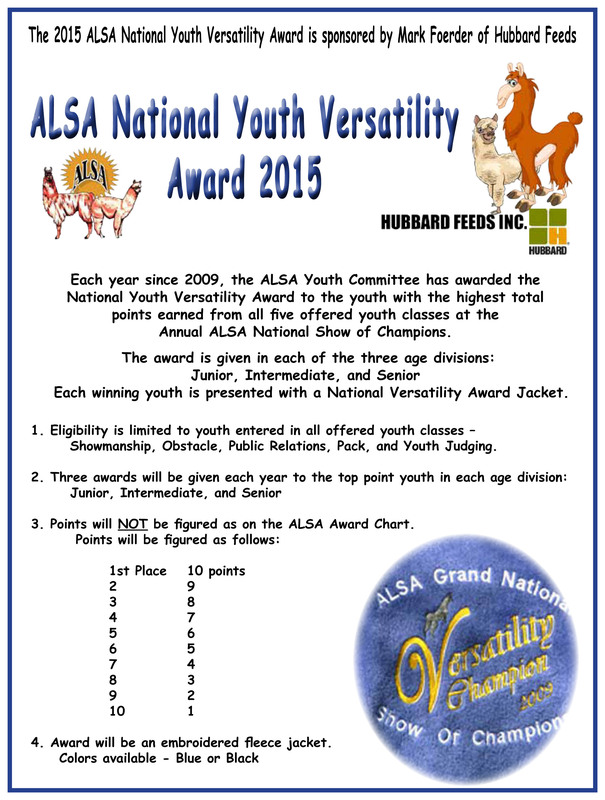 In order to be eligible for the Versatility Champion award, the youth must have shown in all youth classes. Each of these youth received an embroidered Versatility Champion jacket. The ALSA Youth Committee sincerely thanks every individual, farm, and organization who has generously donated to the ALSA Youth for the Grand National Versatility Award. To return "home" quickly, click on the ALSA logo from any page.